With universal concatenation, you can retrieve data from unlike data sources in a single request. All data, regardless of source, appears to come from a single file. The Universal Concatenation dialog box, available from Report Painter, applies the MORE command to your procedure. You can concatenate all types of data sources, provided they share corresponding fields with the same format. You can use WHERE and IF selection tests in conjunction with MORE. One main request that retrieves the first data source and defines the data fields, sorting criteria, and output format for all data. Subrequests that define the data sources and fields to be concatenated to the data of the main request. The fields printed and sorted by the main request must exist in each concatenated data source. If they do not, you must create them as virtual fields. During retrieval, data is gathered from each data source in turn, then all data is sorted and the output formatted as specified in the main request. From Report Painter, select Universal Concatenation from the Report menu. Click the Universal Concatenation button, located on the Setup toolbar, as shown in the following image. The Universal Concatenation dialog box opens, as shown in the following image. If there are temporary HOLD files associated with the procedure, HOLD files are available from the Open dialog box, as shown in the following image. All fields referenced in the main request must either exist with the same names and formats in all the concatenated files, or be remapped to those names and formats using virtual fields. Referenced fields include those used in COMPUTE commands, headings, aggregation phrases, sort phrases, and the PRINT, LIST, SUM, COUNT, WRITE, or ADD commands. Format type and length must be equal. Format type must be the same. Format type and scale must be equal. Format information (type, length, components, and order) must always correspond. Edit options must be the same. Text (TX) fields and CLOB fields (if supported) cannot be concatenated. The following image shows the Universal Concatenation dialog box. The following tools are available from the Universal Concatenation toolbar. Add Source enables you to add an additional data source. Select a Master File and click Open. Launches the Define tool. The Define tool enables you to create a virtual field as a component in a reporting procedure. The objective is to define or modify fields to match the report fields from the main request. Define the virtual field by assigning a format and typing an expression or composing it using the calculator and the fields and functions listed in the tabbed panes in the Define tool window. The DEFINE expression is written in the procedure ahead of the TABLE request. Opens the Expression Builder. You can create a Where, If, or Where Total expression from there. Deletes the selected data source, or selected expressions, from the list. Moves the selected data source up or down the list. Shows a field tree of data sources, filters, and unresolved concatenations. 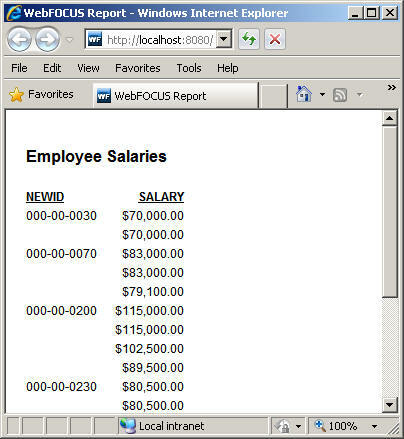 Note: The data source and report field items are preceded by status icons to indicate if the additional data source fields are configured correctly, as shown in the following example. Double-click the field name or filter expression to open the associated tool. Select this option to create the missing defines for the data source. 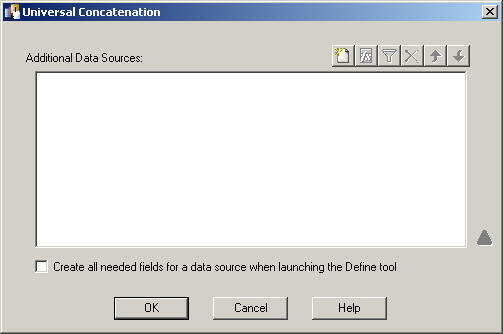 A message appears before the Define tool opens, stating which DEFINEs will be created and require expressions, followed by a list of the created DEFINE fields. Note: This option is off by default. The Universal Concatenation dialog box stores this setting when the Universal Concatenation dialog box is reinitialized. The following image is an example of the message that appears when selecting this option. Click OK to open the Define tool to create the required expression. Shows warnings and miscellaneous information about the concatenation that you are creating. Note: If the Warning icon is activated, this means there is unresolved information for the data source. Click the Warning icon for details, as shown in the following example. Closes the Universal Concatenation dialog box and applies the MORE command to the procedure. Closes the Universal Concatenation dialog box without saving any changes. Opens the documentation topic related to Universal Concatenation in Report Painter. The following example concatenates data from the EMPDATA and SALHIST data sources. Tip: EMPDATA contains sample data about company employees. SALHIST contains information about employee salary history. These data sources (empdata.mas and salhist.mas) are available from the ibisamp folder of your Developer Studio application (apps) directory. You may copy these source files to the project directory of your choice. With the Procedures folder highlighted, click New from the File menu. Right-click the Procedures folder and click New from the context menu, then click Procedure. Type MORE_rp in the File name field and click Open. 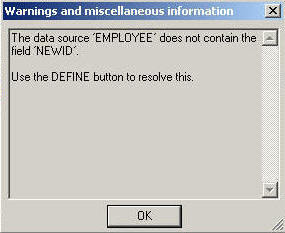 Define NEWID in the EMPDATA data source with the same name and format as the sort field that will be referenced in the main request. Click the yellow diamond and select Define from the Component Connector toolbox. Select empdata.mas as the data source and click Open. Type NEWID as the Field name. Type A11 as the Format. The EMPDATA Define object is added to the Procedure Viewer. Create the main request for the universal concatenation. Click the yellow diamond and click Report from the Component Connector toolbox. Type Employee Salaries in the Page Heading object. Identify your sort column for the main request. Click the By button on the Report Painter toolbar, then double-click or drag NEWID from the Fields tab of the Object Inspector. Identify your print column for the main request. Click the Detail button on the Report Painter toolbar, then double-click or drag SALARY from the Fields tab of the Object Inspector. Create the WHERE clause for the main request. Note: The WHERE criterion in the main request applies only to the EMPDATA data source. Create the universal concatenation with the MORE command. This concatenates the SALHIST data source to the EMPDATA data source. Click the Universal Concatenation icon, located on the Setup toolbar. Click the Add Source icon from the Universal Concatenation toolbar. Select salhist.mas as the data source and click Open. 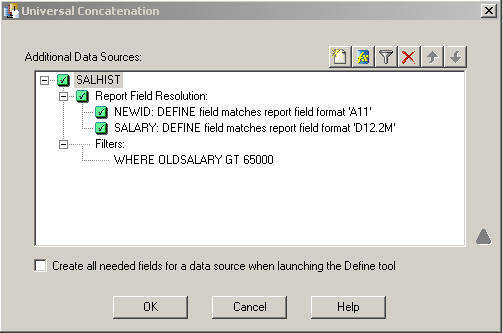 The SALHIST data source appears in the Universal Concatenation dialog box, indicating status icons for the field names, as shown in the following image. 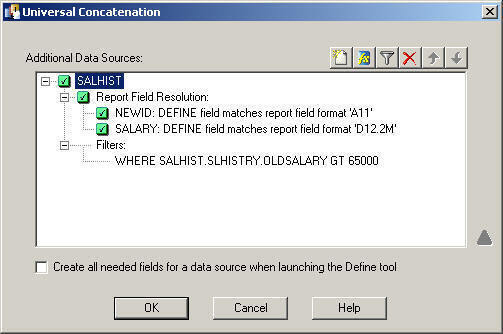 Define the NEWID and SALARY fields in the SALHIST data source, to create the required expression with the same name and format as the sort field referenced in the main request. Click the Define icon from the Universal Concatenation toolbar. Click New to create an additional Define field. Type SALARY as the Field name. Type D12.2M as the Format. The Universal Concatenation dialog box shows the report field resolutions, as shown in the following image. The status icons indicate that the required expressions are defined. Create a filter for the SALHIST data source. Click the Where/If icon from the Universal Concatenation toolbar. The Universal Concatenation dialog box shows the filter expression, as shown in the following image. Note that this WHERE criterion applies only to the SALHIST data source. Notice that it references a field that is not defined in the EMPDATA data source. Note: To view or modify any of the fields from the Additional Data Sources window, double-click the field name or filter expression to open the associated tool. Click OK to close the Universal Concatenation dialog box. The MORE command is added to the procedure. When you concatenate data, record sets are simply appended, not grouped or aggregated across files. Therefore, if duplicate sort fields exist, they show up twice in the report output.